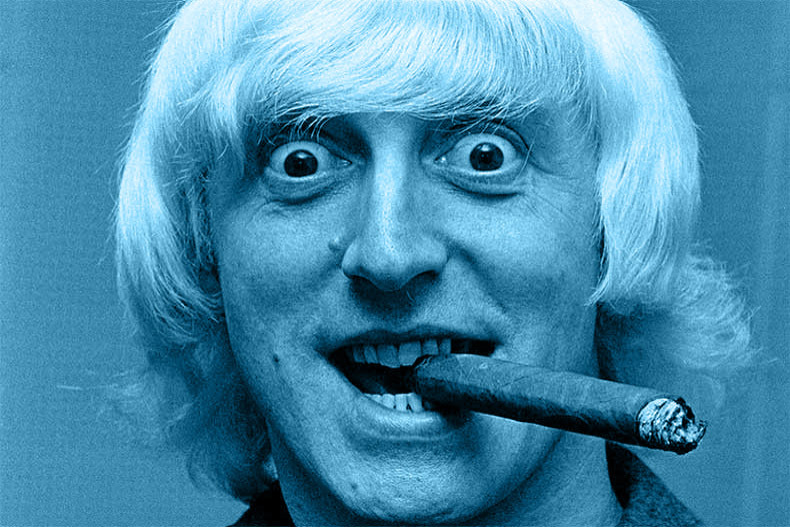 So… what do we know about Jim (-my Saville)? There was a typo on his very elaborate and aggrandising tombstone. Luckily it was only unveiled a few weeks before his misdeeds came to light and was subsequently destroyed. I believe he was interred at 45 degrees so he could see the sea. Really? I thought the 45 degrees was so we could all pi55 and s**t down it. I for one will never understand how that talentless monster ,in his pursuit of innocent flesh, managed to hoodwink the British establishment, from hospital staff,to Thatcher, into letting him get away with it. As long ago as 1978,Johnny Rotten conducted an interview warning about Saviles behaviour. It was cut by the B.B.C. His protection for all those years leaves many questions unanswered and they probably won’t be. As long ago as 1963, everyone I knew considered him a total waste of space. We didn’t suspect his predilections, but he was by some margin the most useless and phony DJ on both radio and TV. Looking back, I do wonder why they kept on employing him. I’d guess that he had ‘information’ on the rumoured paedo rings in high places, and would have spilled the beans if he’d been collared at the time. Not sure if many of you were born when the 1966 Aberfan disaster occurred but I was a teenager and I recall well, the immense feeling of horror. My grandson is currently doing some schoolwork on the history of mining ,this being an area where once upon a time mining was everything.